PC Magazine (shortened as PCMag) is an American computer magazine published by Ziff Davis. A print edition was published from 1982 to January 2009. Publication of online editions started in late 1994 and continues to this day. In an early review of the new IBM PC, Byte reported "the announcement of a new magazine called PC: The Independent Guide to the IBM Personal Computer. It is published by David Bunnell, of Software Communications, Inc. ... It should be of great interest to owners of the IBM Personal Computer". The first issue of PC, dated February–March 1982, appeared early that year. (The word Magazine was not added to the logo until the first major redesign in January 1986). PC Magazine was created by Bunnell, Jim Edlin, and Cheryl Woodard (who also helped David found the subsequent PC World and Macworld magazines). Edward Currie and Tony Gold, a co-founder of Lifeboat Associates who financed the magazine, were early investors in PC Magazine. The magazine grew beyond the capital required to publish it, and to solve this problem, Gold sold the magazine to Ziff-Davis, which moved it[clarification needed] to New York City. Bunnell and his staff left to form PC World magazine. The first issue of PC featured an interview with a very young Bill Gates, made possible by his friendship with David Bunnell who was among the first journalists and writers to take an interest in personal computing. By its third issue PC was square-bound because it was too thick for saddle-stitch. At first the magazine published new issues every two months, but became monthly as of the August 1982 issue, its fourth. In March 1983 a reader urged the magazine to consider switching to a biweekly schedule because of its thickness, and in June another joked of the dangers of falling asleep while reading PC in bed. Although the magazine replied to the reader's proposal with "Please say you're kidding about the bi-weekly schedule. Please? ", after the December 1983 issue reached 800 pages in size, in 1984 PC began publishing new issues every two weeks, with each about 400 pages in size. In January 2008 the magazine dropped back to monthly issues. Print circulation peaked at 1.2 million in the late 1990s. 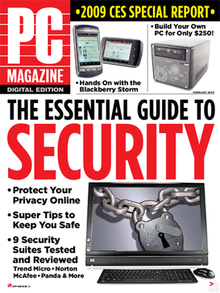 In November 2008 it was announced that the print edition would be discontinued as of the January 2009 issue, but the online version at pcmag.com would continue. By this time print circulation had declined to about 600,000. Dan Costa is the current editor-in-chief of PCMag.com, the website of the now-folded magazine. Prior to this position, Costa was executive editor under the previous editor-in-chief, Lance Ulanoff. Ulanoff held the position of editor-in-chief from July 2007 to July 2011; the last print edition of the magazine appeared in January 2009, although Ulanoff continued on with the website PCMag.com. Jim Louderback had held this position of editor-in-chief before Ulanoff, from 2005, and left when he accepted the position of chief executive officer of Revision3, an online media company. Editor Bill Machrone wrote in 1985 that "we've distilled the contents of PC Magazine down to the point where it can be expressed as a formula: PC = EP2. EP stands for evaluating products and enhancing productivity. If an article doesn't do one or the other, chances are it doesn't belong in PC Magazine." Abort, Retry, Fail? (a beginning-of-the-magazine humor page which for a few years was known as Backspace — and was subsequently the last page). For a number of years in the 1980s PC Magazine gave significant coverage to programming for the IBM PC and compatibles in languages such as Turbo Pascal, BASIC, Assembly and C. Charles Petzold was one of the notable writers on programming topics. The magazine has evolved significantly over the years. The most drastic change has been the shrinkage of the publication due to contractions in the computer-industry ad market and the easy availability of the Internet, which has tended to make computer magazines less "necessary" than they once were. This is also the primary reason for the November 2008 decision to discontinue the print version. Where once mail-order vendors had huge listing of products in advertisements covering several pages, there is now a single page with a reference to a website. At one time (the 1980s through the mid-1990s), the magazine averaged about 400 pages an issue, with some issues breaking the 500- and even 600-page marks. In the late 1990s, as the computer-magazine field underwent a drastic pruning, the magazine shrank to approximately 300 and then 200 pages. Today,[when?] the magazine runs about 150 pages an issue. [clarification needed] It has adapted to the new realities of the 21st century by reducing its once-standard emphasis on massive comparative reviews of computer systems, hardware peripherals, and software packages to focus more on the broader consumer-electronics market (including cell phones, PDAs, MP3 players, digital cameras, and so on). Since the late 1990s, the magazine has taken to more frequently reviewing Macintosh software and hardware. PC Magazine has consistently positioned itself as the leading source of information about personal computers (PC) and PC-related products, and its development and evolution have mirrored those of computer journalism in general. The magazine practically invented the idea of comparative hardware and software reviews in 1984 with a groundbreaking "Project Printers" issue. For many years thereafter, the blockbuster annual printer issue, featuring more than 100 reviews, was a PC Magazine tradition. The publication also took on a series of editorial causes over the years, including copy protection (the magazine refused to grant its coveted Editors' Choice award to any product that used copy protection) and the "brain-dead" Intel 80286 (then-editor-in-chief Bill Machrone said the magazine would still review 286s but would not recommend them). During the dot-com bubble, the magazine began focusing heavily on many of the new Internet businesses, prompting complaints from some readers that the magazine was abandoning its original emphasis on computer technology. After the collapse of the technology bubble in the early 2000s, the magazine returned to a more-traditional approach. In the 1980s, there was a PC Disk Magazine edition which was published on floppy disk. The online edition began in late 1994 and started producing a digital edition of the magazine through Zinio in 2004. For some years in the late 1990s, a CD-ROM version containing interactive reviews and the full text of back issues was available. There was also a special "Network Edition" of the print magazine from 1993 to 1997. This evolved into "Net Tools", which was part of the general press run, and the current "Internet User" and "Internet Business" sections. Numerous books have been published under the "PC Magazine" designation, as well. Dvorak's name has also appeared on many books. PC Magazine is now available in an interactive tablet format for the iPad on the iTunes Store. It is also available on Google Play and Zinio, among others. ^ Williams, Gregg (January 1982). "A Closer Look at the IBM Personal Computer". BYTE. p. 36. Retrieved 19 October 2013. ^ "Front cover". PC Magazine. Feb–Mar 1982. p. 1. Retrieved February 17, 2012. ^ a b Sandler, Corey (November 1984). "IBM: Colossus of Armonk". Creative Computing. p. 298. Retrieved February 26, 2013. ^ Wise, Deborah (December 20, 1982). "Staff Walks Out on PC Magazine, Starts New Journal". InfoWorld. Popular Computing, Inc. 4 (50): 1–8. ISSN 0199-6649. ^ Bunnell, David (June–July 1982). "For Ten Minutes PC Was Free". PC Magazine. p. 19. Retrieved 21 October 2013. ^ a b Siebert, Bill (March 1983). "Double Time". PC Magazine. p. 31. Retrieved 21 October 2013. ^ Lindsay, Robert S. (June 1983). "Legal Ramifications". PC Magazine. p. 46. Retrieved 21 October 2013. ^ "PC Magazine issues list". PC Magazine. Retrieved 29 June 2011. ^ Lance Ulanoff (November 19, 2008). "PC Magazine Goes 100% Digital". PC Magazine. Retrieved 2011-03-19. ^ Clifford, Stephanie (November 19, 2008). "PC Magazine, a Flagship for Ziff Davis, Will Cease Printing a Paper Version". The New York Times. ^ Dan Costa (July 12, 2011). "Editor's Note: Six the Hard Way". PC Magazine. Retrieved April 5, 2012. ^ Machrone, Bill (1985-11-26). "Compatibility Wars—Here and Abroad". PC Magazine. p. 59. Retrieved 29 October 2013.